If you don't know wat dis weekend is, you probably live undah Mauna Kea. It's Super Bowl Sunday and frankly, I no give a crap. As a Niner Faithful, it's been choke long since we've been to da promised land - and actually won - and since then, da teams dat earned da right to play in da most glorious game evah, nevah made me want to sit down and "watch". In fact, last year was da first time evah dat I actually sat down and watched da half time show only cause was Hawaii's own Bruno Mars performing and he rocked it! It probably doesn't help dat da Seahawks (I call them something else but dis is a G-rated blog) are back in there as I just no like them.... except Russell Wilson who is a class act both on and off da field. Da majority of their high profile players are high makamaka-chip on their shoulder-us versus da world-no one respects us-we da most baddest okole's out there kine attitudes and they no shame to act it out either. They openly admit to "cheating" - well, they claim if they haven't been caught or caught only a few times from da hundreds of times they've "cheated" da benefits outweigh da risk. No joke. They flat out admitted it last year and hea they are laughing their okole's to da bank in their opponents "Deflate-gate" scandal. Actually BOTH teams have a history of "cheating" whether it be PED's (performance enhancing drugs), video taping opponents signals or just blatantly defying da NFL, I guess it is true in sports dat da benefits outweigh da risks and win at all costs and deal with da fallout latah. Anyways, for those Seahawk and Patriot fans, good luck! In dis day and age of electronic mischief, most information - and opinions - are shared online whether it be via blogs, forums, chat rooms, social media or da like. Da secrecy of hiding behind a screen name - or handle - is not only obviously for one's own security but mainly for da anonymity of nevah being known which in turn leads to a bit more machismo and judgement. I would say 100% - rogah, ONE HUNDRED PERCENT! - of all da comments left online are not "true". Well, it is true to a certain extent but more than likely you're saying (typing) something something you wouldn't say to a stranger face to face as etiquette is usually thrown out da Aloha Tower. Look at today's world wide web wea every single article - no mattah wat da site - having da ability to leave a "comment" to be "heard" is so commonplace dat it's uncommon not to have one. Da funny thing about ALL of them? They all have da same "characters". OMG! - Basically a person who has Kleenex with them at all times - always gotta comment with sympathy or empathy and/or needs dat in return. High Makamaka - Dis person has worn out da F5 key constantly refreshing their screen to see if people have responded to their post and wondering "why not" if no one has responded to their most clever, witty and obviously da most overwhelmingly interesting post evah. Hog Cheese - Gotta have your "name" on EVERY possible article there is no mattah wat da topic. Sukebe - Need I say more? Well, ok. Dis da kine people dat boderline make you tink if they stay taking their meds cause da things dat they "say" or have said they've done is sketchy at best. You really wondah with their mindset how they even learned to use one computah - probably some inbreeding action going on. Da Babooze or Kolohe - Dis person usually has nothing relevant to say/add but likes to change things up with a joke, chillax message or "why you mad brah?" They also are instigators and like to egg people on just to see da reaction all da while cracking up behind da screen. My $h!t No Stink - Kinda like da high makamaka people but only thing is dat they've NEVAH messed up. They walk on watah and ALWAYS are righteous in their way of life and have nevah wronged a soul. False Crack - Dis kine people probably irk people da most. They say things without proof or fact or state it's a fact wen obviously it's not - or "shown" proof to be wrong - and then still so adamant dat they are right. Fiction or not, it's all da same.... cause it's on da internet. No worries, it's au' good cause hea at WWD! cause Da WWD! Hui has long shown dat we can get along even with differences in our backgrounds and experiences as long as get da kine mutual respect. We all get along no mattah wat kine character you are. But plausible deniability no count. Wat kine character you? Am I missing a type? Are you even a type? 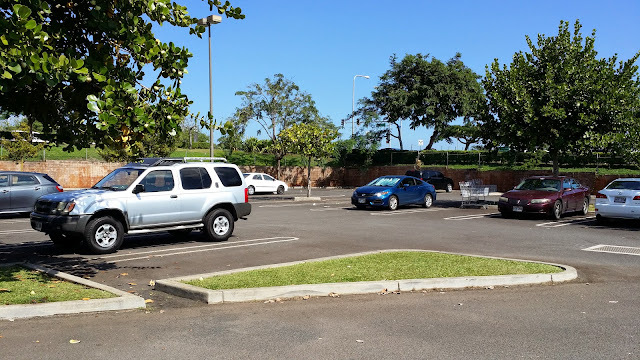 As we were at Waipio Costco Sunday morning doing our weekly grocery pickup, I noticed without fail, vehicles parked along da curb wea obviously it wasn't designated - nor painted with curb parking marks - to do so. Every week I ask myself, why? 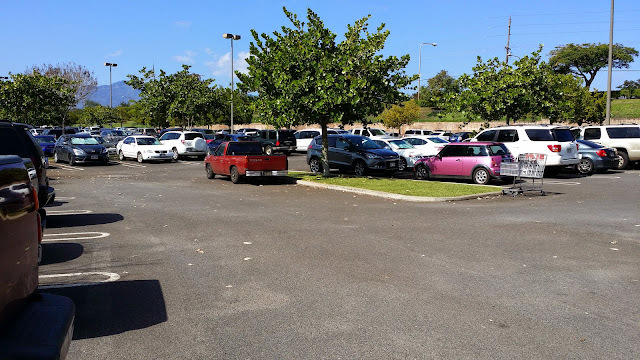 Why would you park your vehicle li'dat wen there are literally choke stalls available and not even mad kine traffic or even da need to troll for a stall? Even wen Costco is PACKED, there are still stalls available albeit it is a hike. Da only time truly there aren't any stalls - or people just too lazy to park far - is during da holidays or wen it's pouring. Please, please, please explain to me da need to park li'dat? Plus making dat turn - I've witnessed it - adds "inconvenience" and those who are not 100% confident in their turning radius makes for some okole quenching stink eye even with da ample space design of da Costco lot. Dat person could have even parked a few feet back while still wrong, would leave a bit more clearance and visual awareness to da turn to be made. Of all da places to do dat too, it's at da apex of a tapered lane making it da narrowest point of da lane. But I guess by da looks of da buss up Nissan, it not going mattah if you bump or scrape it up a little.... it surah as heck ain't making it look worse. In light of police officers across da country having to defend all their actions, they - as a whole - have gotten a bad rap, generally speaking of course. Surah there are those who skirt or even break da law, are overly aggressive, think they bad a$$e$ or could/should have approached situations differently but let's not forget their sworn duty is to protect and serve. On Monday night aftah playing basketball at da Y, I headed up Punchbowl Street and da lights were out at Punchbowl and Vineyard. There were two officers standing in da middle with their reflective vests, strobing flashlights and whistles. Considering dat da lights were out, there are still people who are clueless on how to approach a non-working intersection. Obviously da first thing is to slow down but dis one lolo coming off da H1 heading west bound was approaching at a high rate of speed. Da officer already had held up all traffic except that one direction and was blowing his whistle, had his hand up with his flashlight pointed in that direction to gain da attention of da clueless drivah. But da officer stood his ground and by da time da drivah realized wat was going on hit da brakes hard and ended up past da crosswalk. Boy was da officer pissed! He stomped ovah and gave a lecture dat I could only imagine wasn't so pleasant then sent da car through to clear da intersection before letting our lanes travel carry on. A thankless duty dat could have ended tragically for not only da officer but for any vehicle going through. Then yesterday, I was able to get home while da sun was still out so I took Da Keiki and Da Baby for a bike and tricycle ride respectively. As we headed to da park, we have to cross Waimano Home Road near Moanalua Road and dat area is notorious for close calls and damaging fender benders so before I even enter da road way make surah da light is red up on Moanalua and no cars are coming flying uphill in da opposite direction. It's all about timing da lights cause at one point there will be no cars - or far away enough - to make your way across.... but you know how my luck goes. We crossed da first half without fanfare and da red light was holding da masses at bay but as soon as we were in da middle, it was like Nascar threw da green flag with a handful of vehicles coming downhill approaching FAST! All I could think was "make eye contact, make eye contact, make eye contact." Luckily in da lane we just entered I made eye contact early and was now focusing on da last lane. Imagine a short stocky asian crossing da street hunched ovah pulling a pink bicycle flanked by a pink helmeted 4 year old and pushing a Red Wagon tricycle with an 18-month old comfortably strapped in - can't miss us right? Looking way uphill, a white car wasn't slowing at da same pace as da oddahs so I stopped instead of trying to dart across da last 10 yards with cargo in tow. Da car I made eye contact with originally looked in his rear view then his passenger side mirror as he observed our action to stop and guess wat he did? He changed lanes to make surah da oddah car would have to stop. Yes, he did so safely and with distance to spare but his quick actions and anticipation of da situation is commendable. Did I mention he was driving tandem in a HPD squad car? So there it was, a squad car in each lane stopping traffic so we could cross safely. As we crossed right in front of him, I flashed him a shaka and in true Hawai'i fashion, he gave me da "respectable" head nod. They both waited till we were on da sidewalk before heading off and as da officer rolled by, Da Keiki turned and waved to say thank you. He gave her a genuine big smile and an enthusiastic wave back. Now das "Serving and Protecting with Aloha". SHOUT OUT: Sorry I missed his car number but he was traveling south-bound on Waimano Home road at approximately 5:45pm probably heading back to the Pearl City Station - just wanted to say a heartfelt, Mahalo to dis young officer (probably in his 30's). His Aloha was witnessed and shared by da parents watching their keiki's football practice (probably watching to see if we were going to get hit) as they all had great big grins aftah da officer waved back to Da Keiki who had a great big grin of her own. Some time ago Da Ohana and I ventured out to da Windward side for a "Discover Windward" event at Windward Mall. Its been a long time since I've "returned" as my ex (waaaaay back in da day) lived not too far from there and having practically lived there for years, it has changed - at least internally. Walking around da event happening in da parking lot, it was like a homecoming of sorts with da air, da chill and all da familiar buildings still around (well, Starbucks wasn't around back then) then Da Keiki still being hungry, we went inside da mall to find something to eat. As soon as I walked in I noticed dis wasn't Kansas anymore. Da food court was renovated with a new dining area and food vendors making it a pleasant surprise considering da before. Da decor was very modernized with Hawaiian contemporary and it was so...... "new" looking. I immediately told Da Keiki to get her hands off da table as I continued to wipe it down only to have to go through wat felt like half da container of wipes. Yea, dat was all from ONE table. I couldn't believe how filthy it was and even moreso, how much accumulation of gunk there was as if da tables weren't evah wiped down since its blessing. I used a handful more wipes than pictured and each time felt like I was peeling layers off an onion. It was a little unsettling dat a place so "new" would be so gross already. There was a couple a few tables down dat saw wat I was doing and they did a double take looking down at theirs having already gone through half their meal now trying to eat hovering ovah their trays and playing Operation trying not to touch their table. Do you wipe down tables wen eating out? Evah wondah if they clean da rag they use to wipe down ALL da tables with? Do you look for newer tables? Have you seen Ala Moana's new tables? Do da leftovah watah marks aftah wiping da table with a rag gross you out? Evah been given wet glass or silverware? At least da Koolau's were serene.